I noted in a previous post how parts of one of the few pleasant traffic-free routes for cyclists in the Borough of Barnet, the path along the Dollis Valley in Finchley, marked on earlier editions of the Transport for London Cycling Guides as open between Waverley Grove, off Hendon Lane, and Dollis Road, and on the current guides as running not so far north, up only to Hendon Avenue, had been closed to cyclists by Barnet Council, apparently at the behest of local residents. In exploring the Brent Cyclists route to the Great Divide Ride starting point at New Southgate, I was able to confirm that at least one small good thing has happened for cycling in Barnet recently (which I had already read of in newspaper reports): the stream-side path from Hendon Lane to Hendon Avenue, through Windsor Open Space, has been re-vamped, and given new (rustic, wooden) signage, and the signs banning cycling are gone (though I did not see any specifically encouraging cycling either). 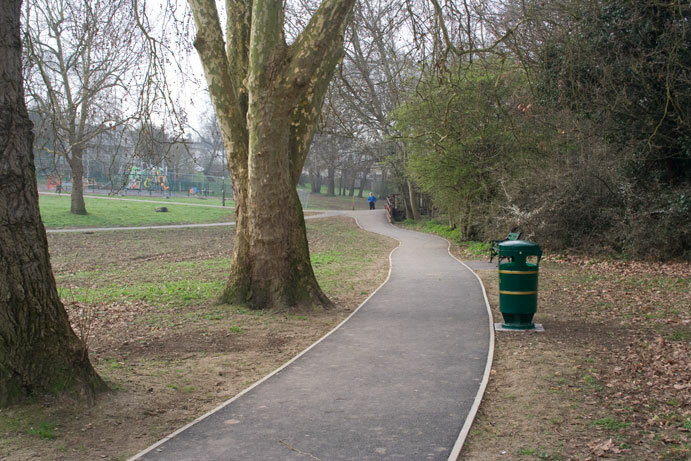 The bulk of the money for the scheme came from a £400,000 grant from the Mayor of London, with £250,000 was also secured from Transport for London for cycle and footpath improvements. I consider cycle lanes to be an unnecessary obstruction to cars, for which of course, roads were built. There is another cycleable section of the Dollis Valley, in Totteridge, where, surprisingly, Dutch-style separate paths for cyclists and pedestrians were provided, years ago. To connect between the two off-road sections one is supposed to use a quiet "back street" route that runs to the east of the brook, between Dollis Road and Whetstone, marked as part of the London Cycle Network. Dollis Road itself, unfortunately, is a particularly nasty piece of narrow rat-run where it runs under a constricting arch of the Northern Line (Mill Hill Branch) viaduct. This has always been the problem point on this route. I have seen signage indications that an off-road route may have been provided here as well as part of this work, but I have not tested it. The on-road LCN route north of Dollis Road is not bad, as it is not a rat-run, though has a difficult crossing of Argyle Road, which is a rat-run, as it forms part of one of the few east-west routes for motor vehicles across the middle part of Barnet, along with the famous Partingdale Lane, over which Brian Coleman successfully battled environmentalists, residents, judges and cyclists to open it to through-traffic, and subsequently widened it. I have encountered several conspicuous examples of motorist aggression on this route. At its intersection with a path called Lovers Walk, the LCN route also sports one of the most ludicrous anti-cycling barrier constructions I have ever seen. Cyclists are require to dismount and wiggle through two caged sections to get between Gordon Road and Brent Way. And what all that extra barrierage adjacent to the footpaths is for, I haven't a clue. When I first saw this, I was incredulous. I could hardly refrain from shouting out loud "Bananas! Absolutely bananas!" as I remounted and cycled away from the spot. Candidate for Cycle Facility of the Month? Junction of the Dollis Valley route with Lovers Walk, looking towards Brent Way, Barnet. Remember, there is no road running through here. This is just the intersection of two paths. That somebody in the council office, with a drawing board, though that all this steelwork was necessary to protect walkers using Lovers Walk from cyclists using the Dollis Valley route is quite incredible. It is probably more evidence of a local hostility to cycling. Only in a nation completely clueless about utility cycling could something so absurd exist. Barmy Barnet: I rest my case, m'Lud. Do please submit the above mysterious metal monstrosity to CFOTM, it surely must be evidence of rampant hyper-cyclophobia. How does a disabled person using a specialised bike 'dismount'? And where are the signs indicating where its safe to remount? I use this route everyday to/from work at Hendon and very rarely at all meet anyone at the chicane. 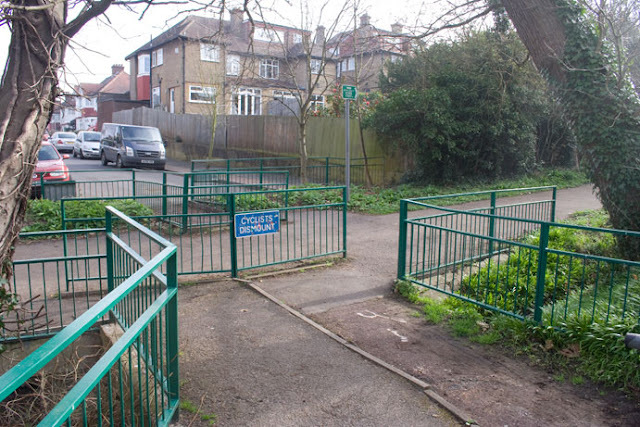 Given the path at right angles is a lighly used footpath it would be much more logical to have the barriers the other way round. Dollis Road is indeed nasty. There is a short section of off road cycle path to get you from Gordon Road to the corner so you have an easier crossing, but from there to the next cycle cut through it is narrow with central islands. Car drivers do seem to see this as a personal challenge to beat the cyclist to the gap or indeed go wrong side of the bollards lest they be delayed for micro seconds. It would be very difficult to do much to sort this out other than a 20 mph speed limit, but of course Barnet will never do that. Meanwhile at work we have been surveyed to ask us what would encourage cycling to work. Get Barnet to spend on cycle paths I responded. So yet again Easy Barnet are out of touch with local employers!